What? The 4th Wall Breaker Meta Games use the video game medium, and especially gameplay, to break the fourth wall by manipulating the game space, that is, the device the game resides in, and the game view, the perception of the player of the game and the game play, the fundamental interaction of the game itself. When? 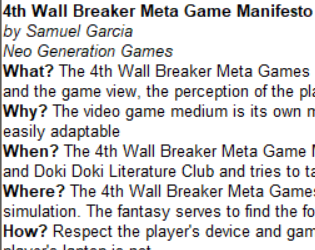 The 4th Wall Breaker Meta Game Manifesto is the result of a history and tradition of games like Metal Gear, Eternal Darkness, Stanley Parable, or more recently, Undertale, One Shot, and Doki Doki Literature Club and tries to take it to the future. Where? The 4th Wall Breaker Meta Games are born in a post-modernistic mind where there is a longing for an absolute reality, truth, and God in an era where it is suspect the whole universe is a simulation. The fantasy serves to find the fourth wall of the Matrix, if there is one. Funnily enough, they can't know. How? Respect the player's device and game space. We create games, not viruses. While burning a Farenheit 451 with matches included in the book is cute, deleting important files in your player's laptop is not. How? Give gameplay elements sentience as pertaining to game view. Give in-game characters sentience. Give the graphical user interface sentience. In Undertale, the graphical interface itself was Chara according to theory. Give the game itself sentience. Maybe its goal for the player is to successfully convince the player to finish the game. How? Give gameplay elements awareness as pertaining to game view. What's the difference between sentience and awareness? Monika from DDLC has sentience and awareness. How? Make game play consequences matter and long lasting. Killing Toriel in the first run of Undertale, despite save scumming, will always be remembered by Flowey. How? Take a basic game play element, and drastically manipulate how much it affects. What are game play elements? Saving. Loading. Pausing. Pressing keys. Turning off the game. Like in the previous point, saving and loading does not erase memories. Monika from DDLC describes a hell when you quit the game. How? Take a basic game play element, and drastically manipulate how much the player controls it. Pausing in SCP Containment Breach will sometimes be unpaused by the game with the words "You can't hide". How? Manipulate the game space behind the scenes. Adding and subtracting files is a common one. Changing desktop wallpapers is another. How? Replicate the game space and manipulate it in front. Instead of causing a Blue Screen of Death on Windows, just show a duplicated image file of it. No need to cause a real one. How? Make things represent more than one thing in the game view. How? Break these rules by the player's consent. If you must make a game about deleting important files in the computer, do so with full warning.